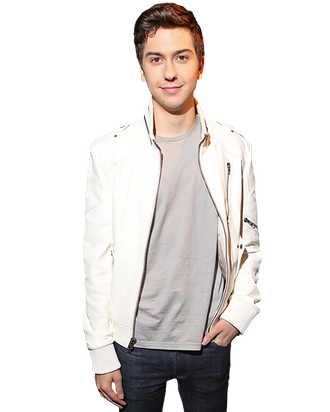 Yes, the star-crossed romance between Shailene Woodley and Ansel Elgort will likely have you crying when you watch The Fault in Our Stars, but spare a few chuckles for Nat Wolff, who plays Isaac. The 19-year-old actor steals several scenes as Elgort’s blind best friend, whether he’s inappropriately groping his girlfriend, dropping a few sardonic quips, or smashing basketball trophies in an act to blow off some steam. It should prove to be a big career boost for Wolff, whom you might have caught in films like Admission or Palo Alto (or may remember from his youthful stint in the Naked Brothers Band) and has several intriguing projects coming up, including an adaptation of The Stand that will reunite him with Fault director Josh Boone. Wolff called up Vulture yesterday to chat about how it’s all going. Let’s talk about the scene where you trash the trophies. Now, I would think that as a human being, it’s kind of fun to break stuff with no consequences. But as an actor, is it a cathartic thing, or is there more to those scenes than I might realize? It was really cathartic. Before the first take, they told me five spots I was allowed to hit with the trophy, and then I waited two hours to shoot the scene. By the time we got to it, I smashed in all the wrong spots. [Laughs.] At the end of a scene like that — especially that specific scene, which was hard to choreograph — I was just happy that we cracked it. It’s good to be able to expel some of my hidden rage. You and Shailene have both been acting since you were pretty young. What do you think that instills in you that might be different from an actor who comes to that career a little bit later? That’s an interesting question. I mean, I think it’s good for some people and sometimes not good for other people — it couldn’t have gone better for Shailene, obviously, because she’s such a brilliant actress. For me, I think I was lucky that even though I was acting since I was a kid, I only acted during my summer vacations. I went to a real school, I did plays growing up and worked with acting teachers. But knowing that I’ve wanted to be an actor since I was a kid was helpful, because if I had just come into a movie like this, I would not have been prepared. When you start in Hollywood that early, is there a time in your life where you sort of reevaluate your acting technique or your desire to be in the business? It hasn’t yet. We’ll see, I guess. I’m lucky that my parents always encouraged me [to believe] that being successful or famous is a great added benefit, but the focus always has to be on the work. Those other things are so transient, so out of your control and, at the end of the day, unimportant. My main focus is always just to be the best actor I can be and the best musician I can be. Some of the people involved in this film have been a little bit overwhelmed by all the attention from crowds, but is that a little easier for you to handle as a musician who’s played a lot of shows? The difference is that you sort of expect that, to some degree, at a concert — you expect people to be screaming or singing along — but this is all for a movie! People are reacting like crazy to lines in a movie. It’s unlike anything I’ve ever seen. When you’re doing a book with such a devoted fan base, how much do you keep the fans in mind? Did you check to see what they thought when you were cast? I tried to avoid it, but I got a lot of people asking, “Why aren’t you blond?” Ansel ended up being a blond, and his character was a brunet, and I ended up being a brunet even though my character was a blond. So it was perfect. We just switched! But the fact that John Green was so happy with what we were doing … I just assumed everybody else would be happy, too, since he knows the book better than anyone. You’ve been in a lot of projects where maybe you were the youngest person on the set. What’s it like to be in a movie like this, with a lot of costars who are your age? I was in this movie Palo Alto earlier this year, and that along with Fault In Our Stars had a lot of teenagers. It was great. It reminded me of when I worked with my brother in Naked Brothers Band when I was younger: There’s a lot of fun and excitement because we’re all in the beginning stages of our careers. But it’s great working with experienced actors, too, because you learn a lot by watching them. There’s stuff that young actors won’t know until they’ve worked for that many years. What was it about the director, Josh Boone, that you first related to? As soon as I sat down with Josh — I was 16 — we just immediately ended up talking about movies and music, just agreeing about so many of the same movies, and disagreeing too. As Josh says, we’re married thematically. He’s gonna be one of the great directors. Had you worked with other directors where there was a different rapport because they didn’t know how to relate to a kid? You and Josh are reuniting for an adaptation of The Stand, one of Stephen King’s most famous novels. What’s your own relationship to the book? I love it! I read it on an audiobook, which took, like, six years. But I liked it, because it almost felt like I was inside it. Obviously, I haven’t started doing the research for it yet, but I think it’s the best post-apocalyptic novel, and Josh is the perfect person to bring it to life: He’s such a huge Stephen King fan, and he’s great with actors and this is a big ensemble. I can’t tell you! I can’t tell you. I don’t know, really, yet. Josh hasn’t really told me, so I wouldn’t be able to tell you … and he’d kill me, anyway. I just hope I get to hold a gun. I haven’t held a gun in a movie yet!